A vehicle crash in Stewartstown NH has lead police to search for an NH teen, alleged to have stolen cars in NH, VT and ME. 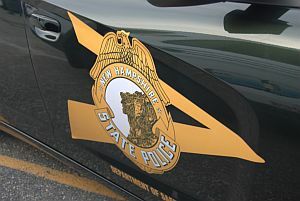 NH State Police said on Sunday when they arrived at a rollover accident on Route 3 in Stewartstown they found the driver had fled the scene. An investigation showed the vehicle was taken from Clarksville NH. While searching for the driver, a report of a stolen pickup truck from Stratford, the truck’s owner reported another vehicle was left nearby, which was found to be stolen. The truck from Stratford was located in a ditch in Stratford. A State Police K-9 was used to search for the suspect and during that search; another vehicle was reported stolen from Northumberland. The vehicle taken from Northumberland was found crashed in Maine where two more vehicles were reported stolen. Police have determined that 11 vehicles were stolen from NH, VT and ME. State Police believe a juvenile from Campton NH is behind the string of thefts and he was last seen in Maine. The Campton Police are also investigating two stolen vehicles from their town and are working with the State Police to help locate the teen. A Chester VT man is facing multiple charges after police said he attempted to burglarize a Cavendish home on Monday morning. Vermont State Police said while investigating the case a Chester police officer discovered Nico R. Spauding’s vehicle near the scene. After an investigation police discovered Spauding had entered the Cavendish residence unlawfully and attempted to gain further access into the home by force. The Spauding was also driving a motor vehicle with a criminally suspended license in addition to being in violation of previously issued conditions of release. Police arrested Spauding for Driving with a Criminal Suspended License, Unlawful Trespass, Attempted Burglary, and Violation of Conditions of Release. Spauding is lodged at the Southern State Correctional Facility for lack of bail. A Cyanobacteria Advisory for Elm Brook Park Beach in Hopkinton was issued by NHDES on Monday. The elevated cyanobacteria cell concentration was measured in Everett Lake at Elm Brook Beach. The heaviest bloom areas were near the boat ramp and appear as a scum on the surface or small blue-green clumps suspended in the water. This warning is not based on a toxin evaluation and is precautionary for short-term exposure. NHDES advises lake users to avoid contact with the water in areas where lake water has a surface scum or blue-green flecks and advises pet owners to keep their pets out of any waters with a surface scum or blue-green or bright green flecks. Acute health effects include irritation of skin and mucous membranes, nausea, vomiting, and diarrhea. Chronic effects include liver and central nervous system damage. The warning will remain in effect until additional samples reveal cyanobacteria levels have diminished. New London Police are asking people not to touch hypodermic needles if found on the roadside. Police said a hypodermic needle was recently found on the side of a road in New London. Please call the New London Police Department if you come across one. The Annual Meeting of the Sullivan County Convention is next Thursday. The annual meeting is to consider the 2018 Fiscal Year proposed budget. The meeting is on Thursday, June 29th in the Lou Thompson Room at the Sugar River Valley Technical Center at 243 North Main Street in Newport at 6:00 pm. The public is invited to attend. A full agenda will be posted on the County’s website by the end of business day on Wednesday, June 28th.